Cymbidiums are subject to bacterial and fungal infections and are also susceptible to the common orchid viruses, primarily Tobacco Mosaic Virus - Orchid (TMV-O) and to a lesser extent Cymbidium Mosaic Virus (CyMV). 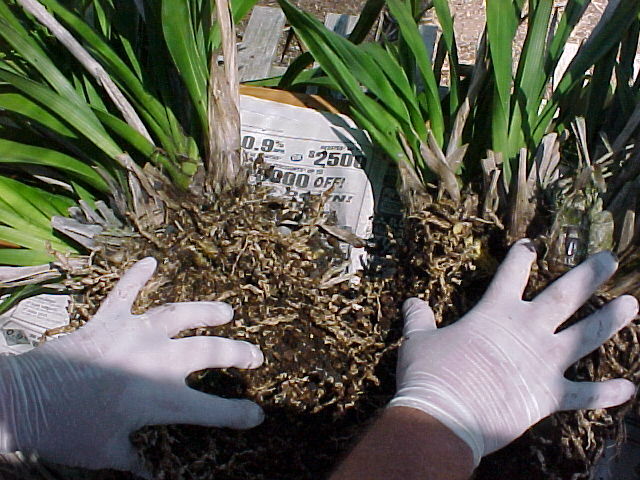 Virus infection of a cymbidium may be caused by insects feeding on an infected plant and then moving to an uninfected plant, but transmission with contaminated tools or your hands during dividing, potting or cutting the flowers, or reusing unwashed and unsterilized pots or flower stakes is usually the cause. 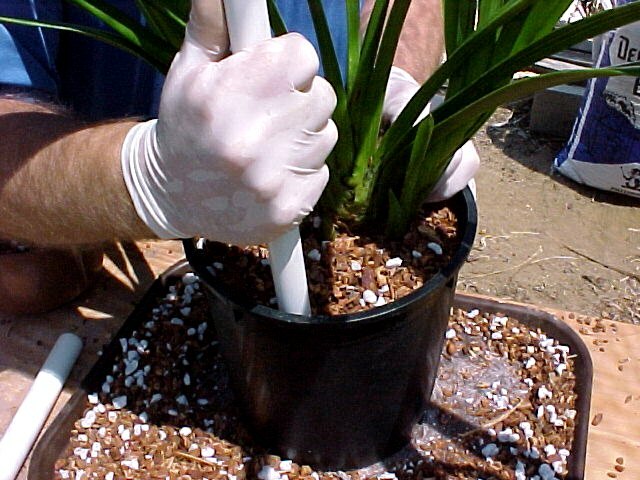 Always sterilize tools and the work area before dividing or repotting each plant, and wash hands thoroughly after each plant, or preferably use disposable gloves since it is very hard to remove all the old potting mix from underneath fingernails. We use a layer of clean newspapers on the potting bench and change between each plant to ensure a clean work surface for each plant. 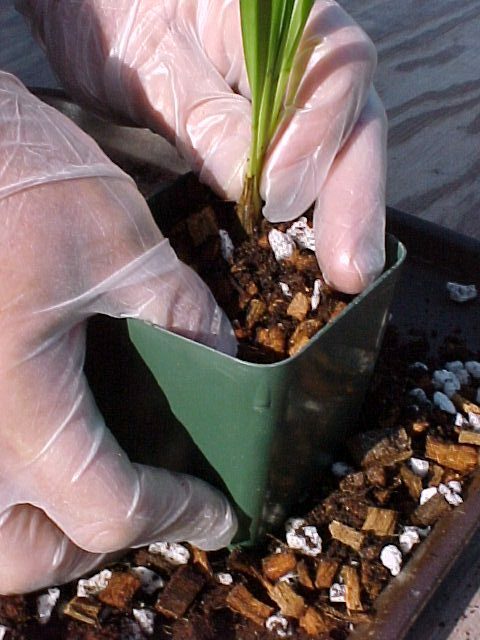 We also use disposable latex or vinyl gloves when dividing and repotting, especially if more than one plant is to be repotted, and change gloves between each plant to prevent disease transmission. We also have a container of 50% bleach solution sitting on the potting bench. 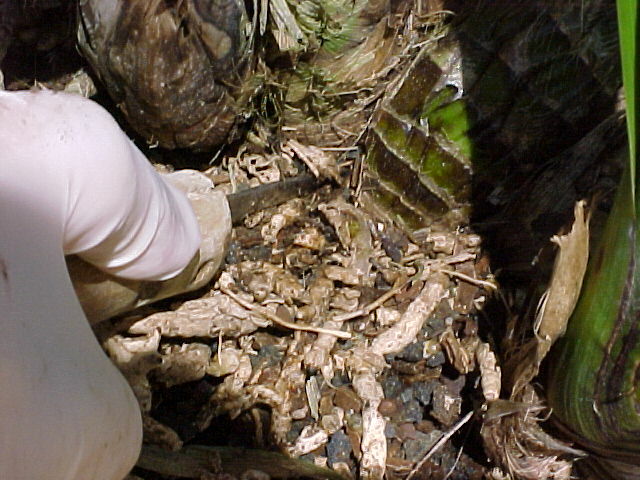 The potting stick and knives are cleaned and then soaked for several minutes in this solution between each plant to reduce the potential transmission of virus or other diseases. Others prefer to flame sterilize tools with a propane torch. 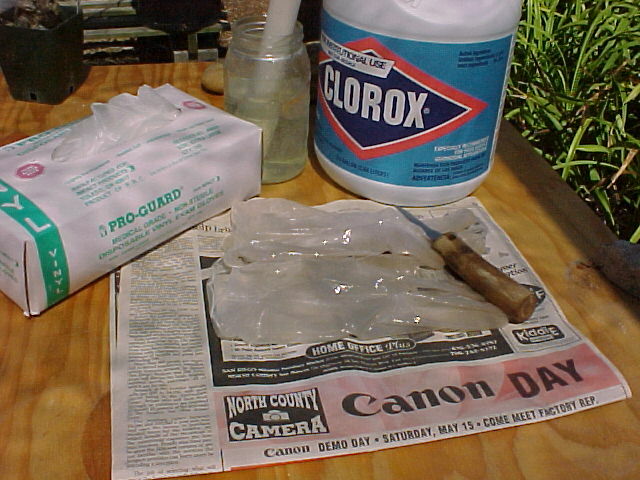 A saturated solution of Tri-Sodium Phosphate (TSP) may also be used to sterilize tools. Tools and supplies for dividing or repotting. The tools and supplies commonly needed for dividing and repotting cymbidiums are relatively few and simple. First is a stable solid surface on which to work. Many growers have made sturdy potting benches at a height most convenient for them to work on. Ours is somewhat more simple than that. We use a 2' x 4' sheet of 3/4" exterior grade plywood treated with a water resistant penetrant setting on two upended 55 gallon steel drums for the main repotting bench, and have another sheet of the plywood setting on 15 gallon nursery containers which are in turn set on top of one of the benches in the shade house. Both are quite portable and easy to move from one location to another if the need arises. The next tool needed is a sturdy knife or shears to cut into the root ball and to trim roots. A potting stick is also used to pack the mix in the pot. We use a 1' length of 1/2" or 3/4" PVC pipe as a potting stick. We have also used old hammer handles or large wooden dowels, but these wear quite rapidly when soaked in bleach for sterilization. A piece of metal pipe could also be used which could be flame sterilized. What can be used for Cymbidium potting mixes? Cymbidiums like a slightly acid potting mix that provides good drainage. 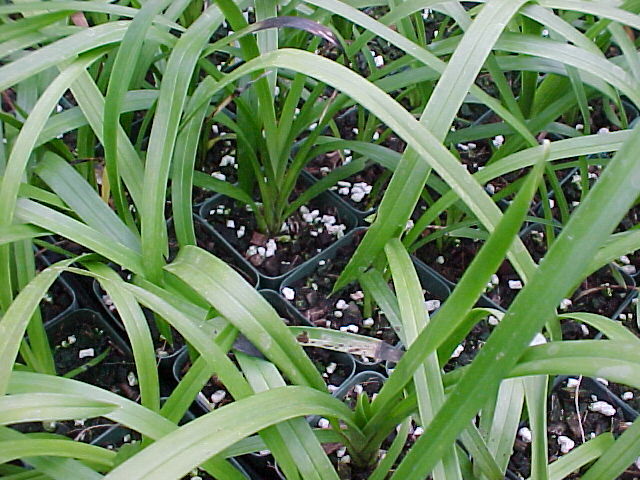 Commercial cymbidium planting mixes are available at specialty nurseries, but many growers use a fine orchid bark mix with 20 - 25 % perlite added. Sand, coarse peat and redwood bark or shavings are often added to improve the water retention in inland locations. 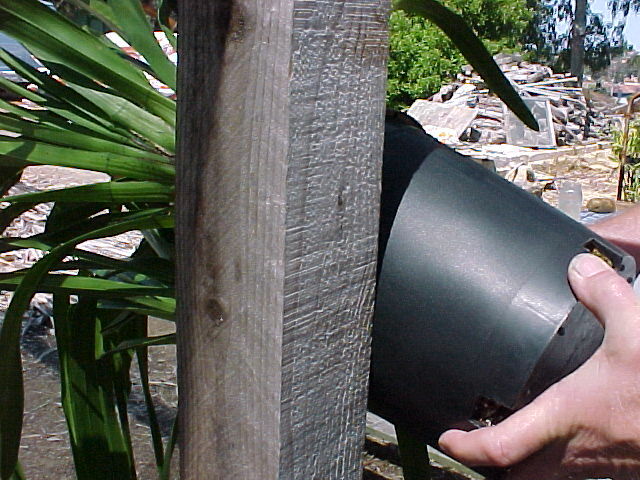 Straight seedling orchid bark (1/8 to 1/4 inch) or medium orchid bark can also be used. 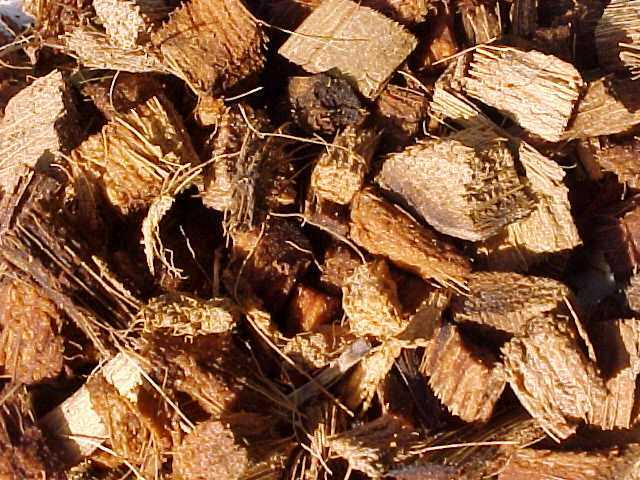 Larger grades of bark will require more frequent watering, but there is less risk of overwatering. 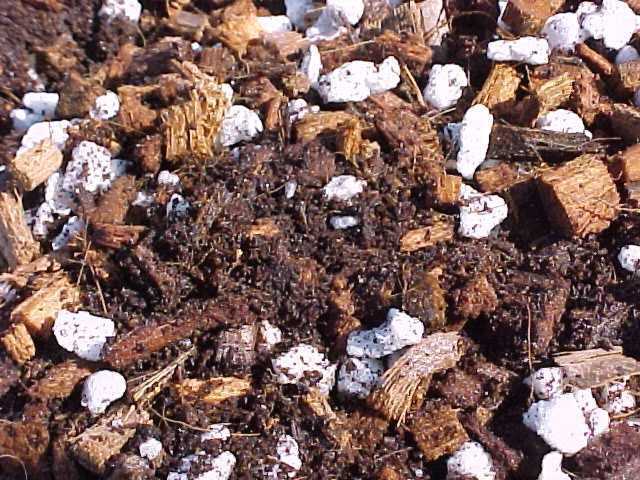 Some add coir, coconut husk chips, coarse peat or leaf mold and sand to the mix also. They can also be grown in mixes containing pumice or lava rock. For mature plants or seedlings in 6" pots, we use a mix of 80% seedling grade (1/8" to 1/4" size) orchid bark mixed with 20% #3 perlite and 1/4 cup of finely ground dolomite lime added for each cubic foot of mix. For larger plants, 40% seedling grade and 40% larger grade of bark, 1/2", with 20% #3 perlite works well. We use the larger grade of bark, 1/2", in a layer in the bottom of the pots to keep the finer mix from working out the drain holes in plastic pots. We have used the finer mix for seedlings in 3 or 4 inch pots as well. We have recently changed to a different mix for all of our cymbidium and zygopetalum plants, and have potted all plants in this new mix for the past few years with very good results. Our new mix is made from coconut husk chips and #3 perlite. We use only coir for seedlings coming out of flask now and have had very good results with it. Coir is the pith from the coconut husk which is removed from the coconut fiber used to make door mats and other fiber products. 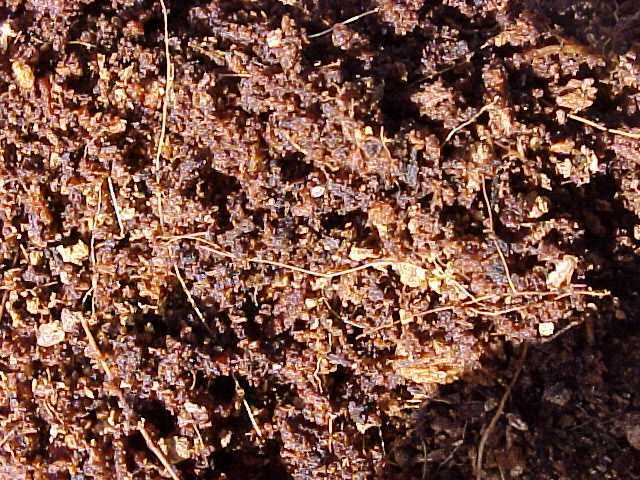 This material is similar to fine peat moss in texture, but is very resistant to breaking down, is very easy to re-wet when dry and holds a good amount of water and also contains about 30% air when saturated. It also rewets very easily if it has been allowed to dry out. The coconut husk chips is just the husk chopped into chunks in several different sizes with a fine grade about 1/4 inch across, a medium grade about 3/8 inch across and a large grade that is a half inch across or larger. The coconut husk chips are usually very resistant to breaking down, although material that has not been heavily compressed works best. Chips that have been highly compressed break down quite a bit faster and hold more water, and I haven't have as good a result with these. We use basicly three different mixes now. For small plants that like to be wetter, we use a mixture of about 40% fine chips, 40% fine chips and 20% perlite. For our seedlings in 3 inch pots, we use 80$ of either fine or medium chips with 20% #3 perlite. For 6 inch pots, we use 40% medium chips, 40% large chips with 20% #3 perlite. Plants in 8 inch and larger pots are potted in only large chips with no perlite. The coir/coco chip mix retains more water than an equivalent fresh bark mix, yet it contains good air spaces and does not break down quickly. Plants potted in this mix for 2 years have great looking root systems with no sign of the mix breaking down. Seedlings potted in this mix do not seem to slow growth at all and have grown significantly within 6 weeks of potting up from flat, with some forming the first bulbs. These plants are 1 year out of flask. Seedlings in this mix often have formed good bulbs with new growths 4 months after potting and have very vigorous root systems and are ready to pot up into 6 inch pots. When does a plant need dividing or repotting? We grow seedlings from flask in 10" x 20" standard nursery half flats or preferably in 98 cell square deep plug trays. The plants grow for about a year in these flats or trays, and will have a 10 - 12 inch leaf length or more and a base diameter larger than a pencil by this time. We do not keep any weak looking or small plants at this stage, and discard any that do not have at least 7 inch leaves and a base diameter smaller than a pencil. These small plants grow too slowly to be commercially profitable. Potting these seedlings is fairly simple. Place the plant in the center of a 3 or 4 inch pot and fill with mix. Press the mix down with your fingers so the plant and roots are firmly held in the pot. The base of the plant should be half an inch below the rim of the pot, and should be about a quarter of an inch below the level of the mix. We water the plants in within a day of potting, and they are then put on the bench and treated the same as other seedlings or mature plants. Cymbidiums generally need to be repotted about every three years under normal conditions. Cymbidiums should be repotted just after the old blooms have fallen off. 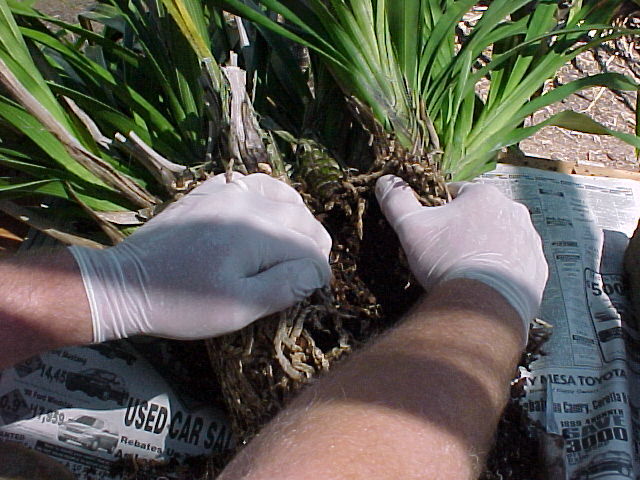 If the old mix is broken down, the plant should be repotted as soon as possible to minimize root rot. Broken down mix tends to hold too much water and will reduce the air movement around the roots which often causes the older roots to die back. If the mix is very soft, the plant probably needs repotting. We insert a finger in the drainhole of a plastic pot to test the condition of the mix. If the mix is soft enough so a finger can enter the mix easily, we will repot. 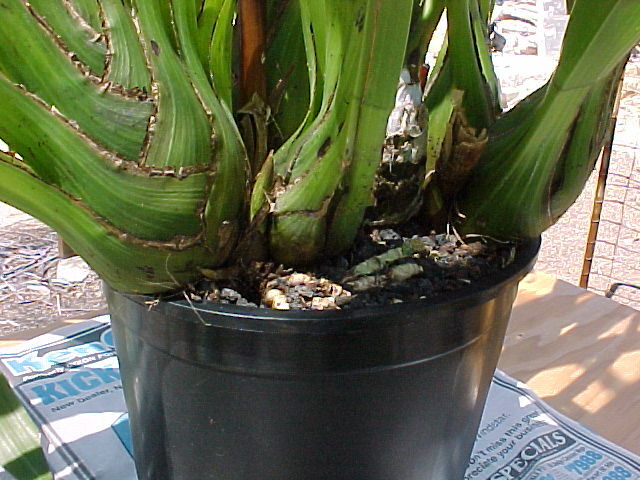 Vigorous plants will often outgrow the pot and may even break the pot before the mix starts to break down. 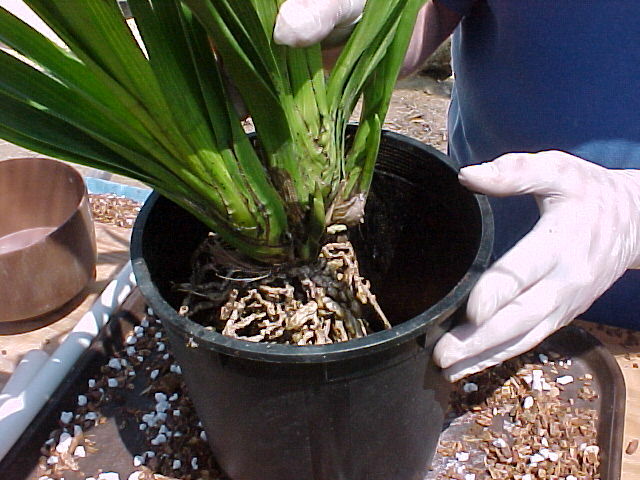 When a cymbidium fills the pot and starts to grow against or over the edge, it should be repotted even if the mix is not broken down. 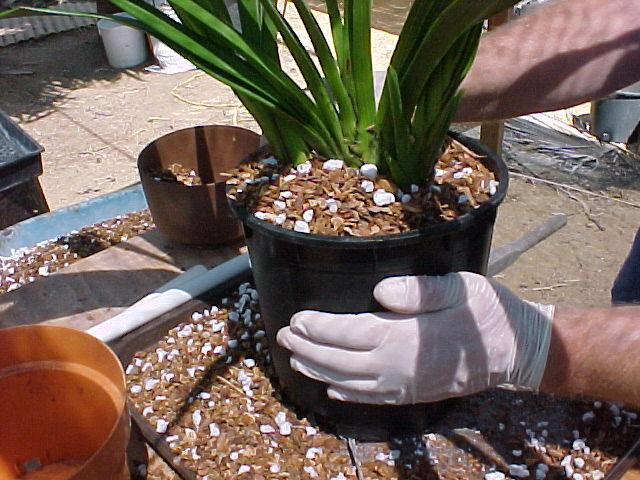 Pot-bound cymbidiums will often be underwatered which can reduce the vigor and blooming capability. How do I divide a large cymbidium? 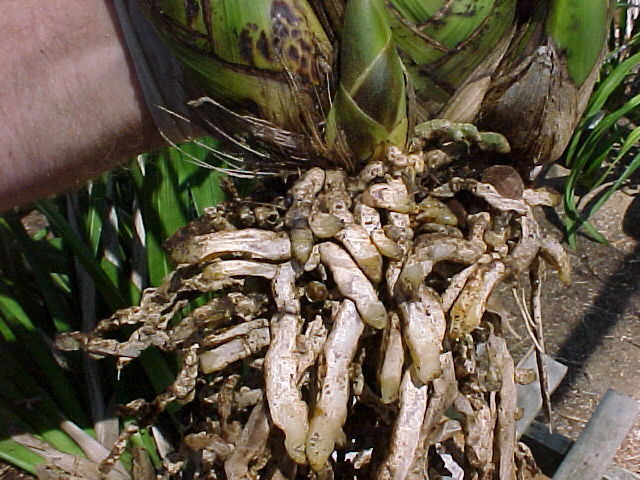 Most large cymbidium plants have leafless bulbs (backbulbs) toward the center of the plant. 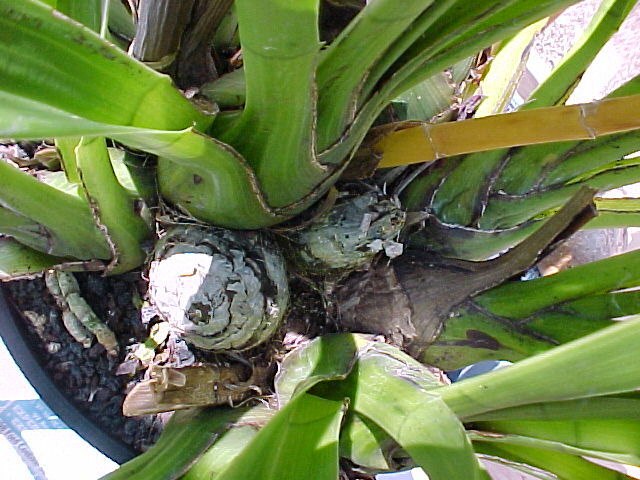 The green divisions of the plant will be connected to the backbulbs, and the location of the backbulbs usually marks the natural dividing points for the plant. 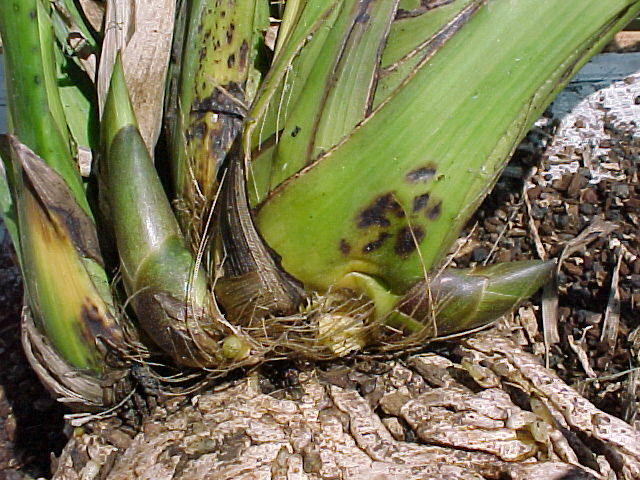 Overgrown or potbound cymbidiums are often difficult to remove from the pot. 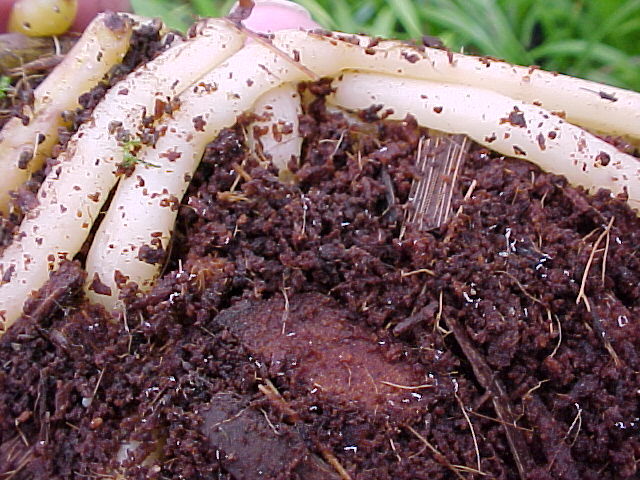 With clay or redwood pots, the root ball can be separated from the pot by working a long thin knife down to the bottom of the pot and cutting it away from the pot. 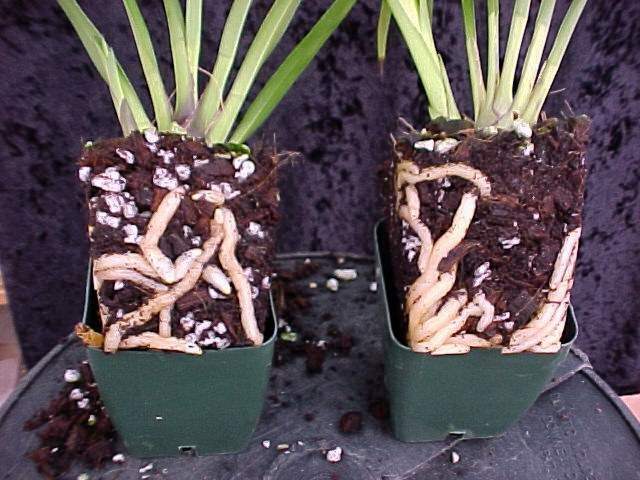 Plastic pots will sometimes deform from the pressure of the roots inside and the only way to remove the plant is to cut the pot down one side. We usually try to dislodge the roots from a plastic pot by literally beating the pot against one of the 4x4 posts in the shade house, and then to knock the pot off the plant with a potting stick. 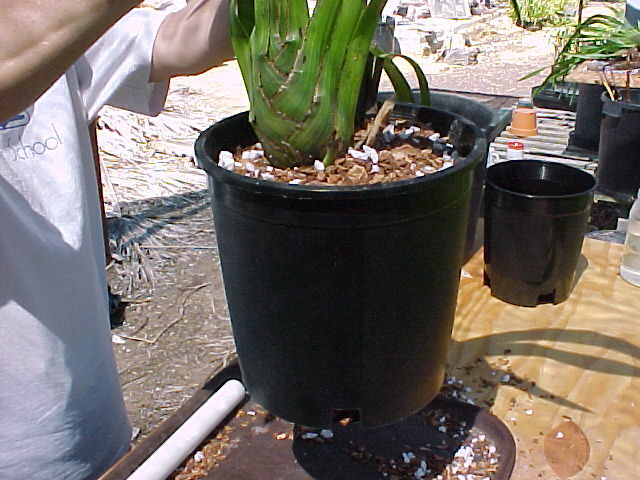 If this is successful, the pot can be salvaged to be used for a division of the plant, or washed and sterilized for reuse at a later time. If the roots are a pale yellow or white color and firm, the root system is in good health. 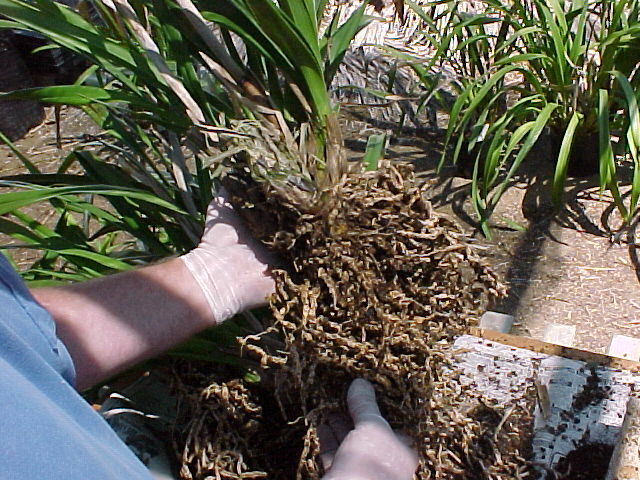 Brown and soft roots indicate the plant has either been in the pot too long or it has been kept too wet and the roots have rotted as a result. 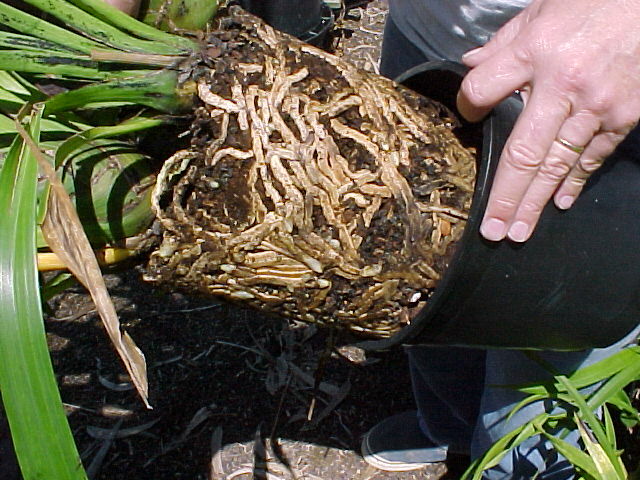 Some loss of roots is normal, but the loss of too many will slow down the growth of the plant. When dividing and repotting, we try to keep divisions with 3 or 4 green bulbs and perhaps one backbulb. For our show and breeding plants, we try to keep larger divisions since they usually have more flowers and are better for show. Smaller divisions will take longer to recover and produce a good blooming plant. Don't divide the plants into single bulb divisions. 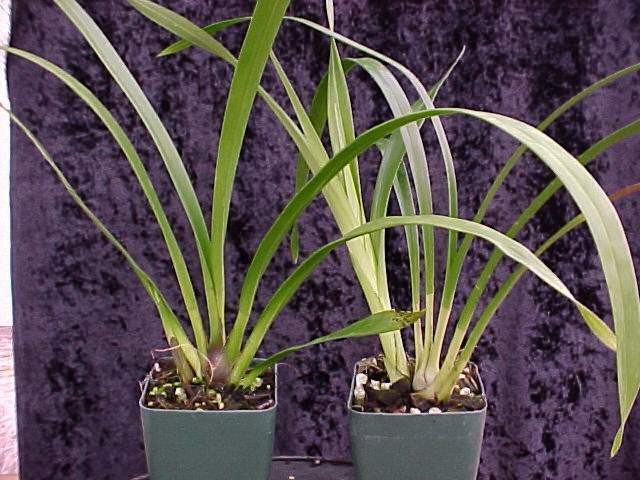 Single bulb divisions often take 2 or 3 years to flower. With the exposed roots and old potting mix in the open, we look for the natural dividing points around the backbulbs as a guideline. If the rootball is filled with roots, we cut the side of the rootball at a point where a natural dividing line appears to be. 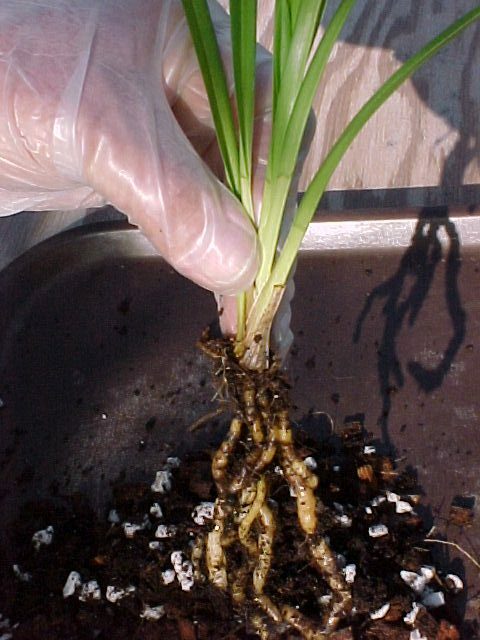 We also try to cut the rhizome connecting the backbulbs apart at the natural dividing point to make it easier to divide. 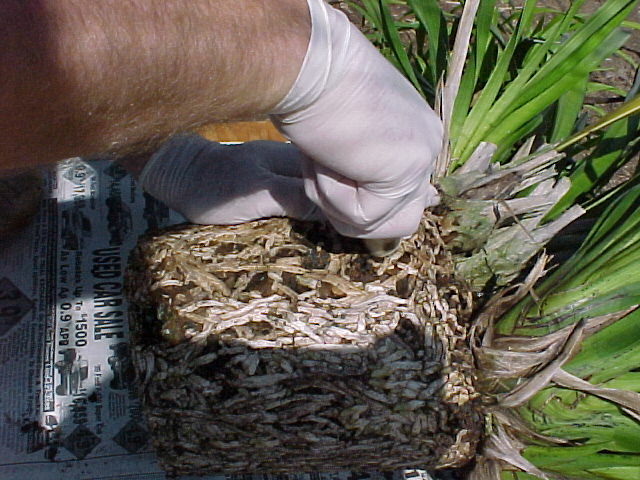 Once the rootball is cut, grasp the sides of the cut and pull the sides apart. This can be a real job on some large plants and may take two people. The plant should separate into two or more pieces along the dividing lines. On large plants which will be divided into several sections, each section will need to be separated from the others. Once the individual sections are separated, clean as much of the old mix and dead or broken roots from the rootball as is practical without damaging the good roots and the new roots. 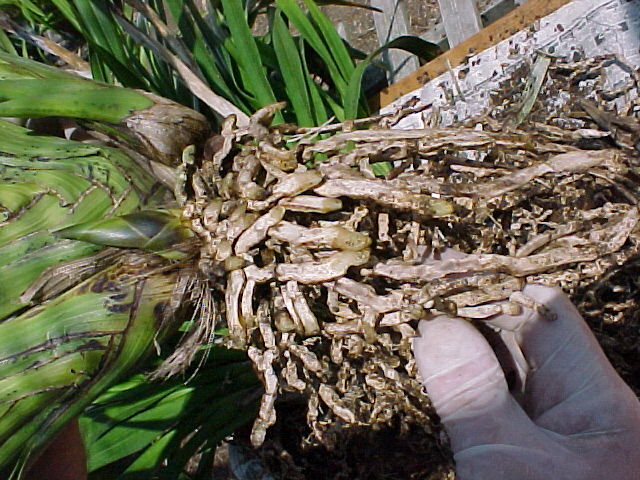 Be careful with new growths or spikes which may be emerging from the base of the psuedobulbs. 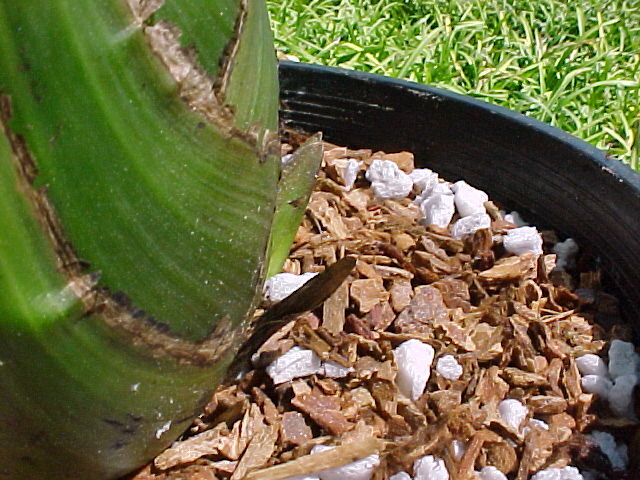 The new growth is on the left in the photograph, the shorter, stubby spike is on the right. The new growths and spikes can be easily broken at this step. Some root pruning may be necessary to fit the plant easily into the new pot. This does not hurt the plant, and will encourage new root growth. We try to leave the roots at least 5 inches long if they are not broken. 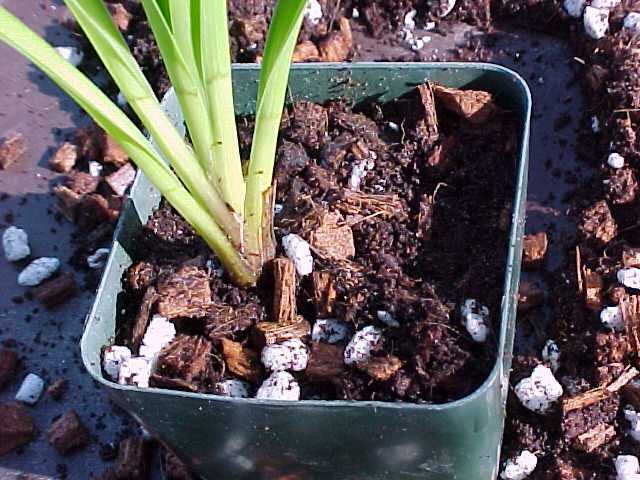 You may have to leave chunks of the rootball with the old potting mix intact for some very vigorous plants which have completely filled the old pot with roots. We usually leave one backbulb on a division when repotting, and remove any remaining older backbulbs. Once the mix and old roots have been removed, the division is ready for repotting. How large a pot should I use? Select a pot large enough to allow 3 years growth. For most cymbidiums, a pot which allows 2 inches of room all around the plant is the proper size. Plants with very large bulbs may require more room or larger pots. Miniature cymbidiums (with small plant size) will require less room, and often do better in shallow pots. We normally use 1 gallon plastic pots for smaller plants with 2 or 3 bulbs, and 2 gallon, 3 gallon or larger plastic pots for large divisions. A gallon pot is usually a 6" diameter by 7" deep pot. 2 gallon pots are usually 8" diameter and 8" deep. 3 gallon pots are about 10" diameter and 9" or 10" deep. Larger plastic pot sizes are usually referred to as tubs and come in 12", 14" or 16" by 10" to 12" deep. We usually drill extra drain holes in the bottom of the 3 gallon or larger pots to improve air circulation and drainage. How do I pot the divisions? 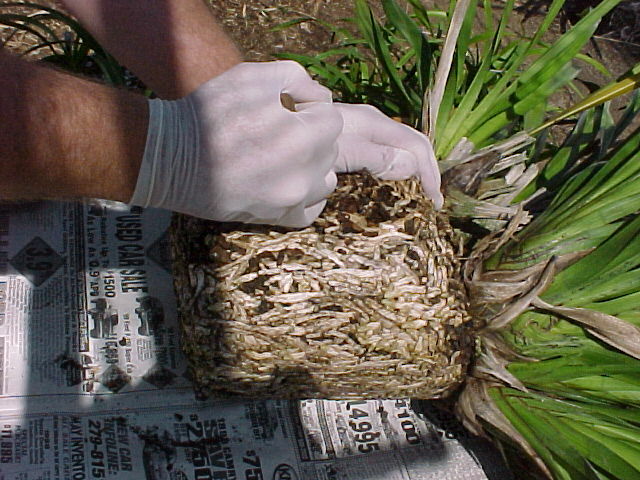 Place a mound of moist potting mix in the center of the pot. Spread the roots over the mound of mix and work mix in among the roots. Do not ball the roots in the center of the pot. Fill the pot with mix and shake or pat the pot vigorously or tap the pot firmly on the potting bench to help the mix settle into the roots. Tamp the mix in around the edge of the pot firmly with the potting stick. The mix should tight in the pot, not loose. One of the guidelines I use for determining whether the plant is tightly potted is to lift it up by the leaves. If it doesn't come out of the pot, the mix is tight enough. Mix that is too loose in the pot will not provide enough support for the roots and also tends to decompose more rapidly. The lower 1/3 of the bulbs should be covered with mix, and the level of mix should be about 3/4" below the rim of the pot to prevent washing the mix out of the pot when watering. 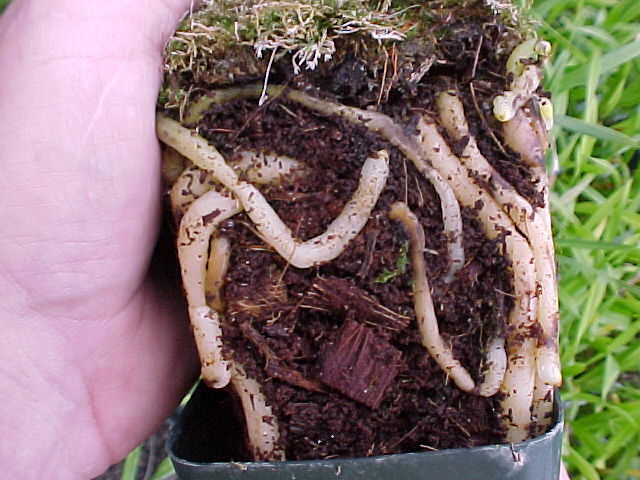 Root growth in the pot will usually fill some, if not all, of this gap in time. The last step in potting the division is to put a tag in the pot to identify the plant. We pot 3 inch pot size seedlings up directly into 6 inch pots when they have reached bulb and growth size with the bulb typically an inch in diameter. Miniature or novelty seedlings may be potted in a 6 inch scotch pot (5 inches tall) if the parent plants are compact growers. All others go into 6 inch gallon pots. These plants are potted in the same manner as a division. After dividing and repotting, the plants should be placed in an area with heavier shade than normal, and should be kept cool and slightly on the dry side for several weeks. This encourages the growth of new roots into the new medium. We water the repotted plants after a day or so in the new mix, and water the first time with a dilute solution of Physan or Naccosan, which is a bactericide and fungicide, to help reduce the likelihood of fungal or bacterial disease in the newly repotted plant. Watering with a dilute solution of Subdue may also help control disease after repotting. Use of an anti-transpirant as a spray or drench after dividing and repotting may help reduce the moisture stress on a plant, but we do not find it necessary under our conditions. 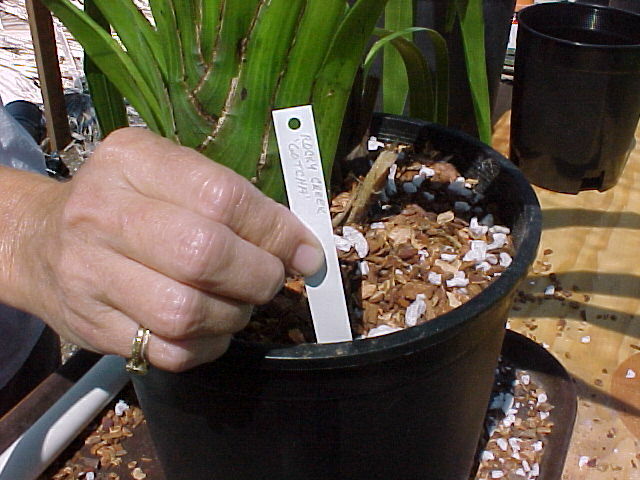 Backbulbs can be used to obtain extra divisions of cymbidiums. Clean the roots and old leaf bases from the backbulb. Place them in a cool dark humid location for several weeks or months and watch for the eyes at the base of the bulb to grow. We place the backbulbs in open plastic bags after a few weeks to reduce moisture loss, but we try to keep moisture from condensing in the bag. The bulb may be prone to rotting if it stays too wet. 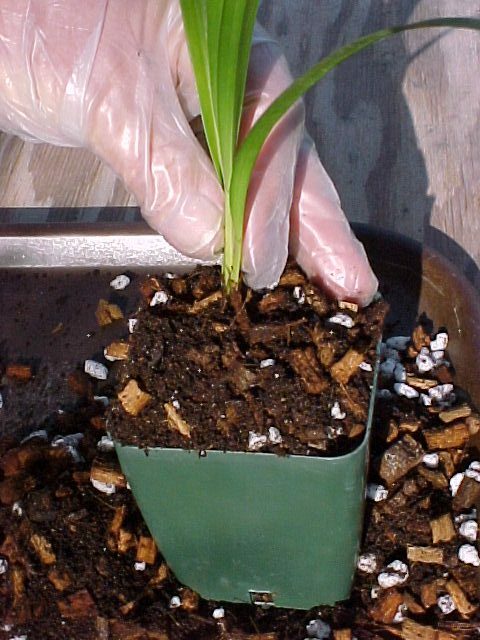 When an eye has definitely started to grow, the bulb can be potted up in a 3" or 4" pot with the new growth toward the center of the pot. Water sparingly until the growth is about 2" tall or until it starts to form roots. 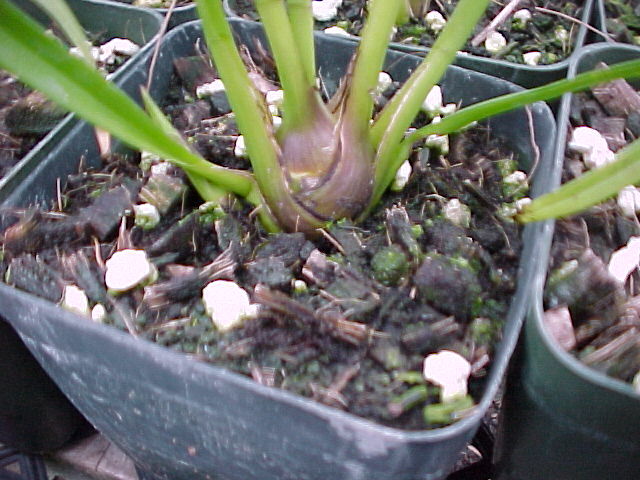 At that point, the plant can be treated as any other small seedling. We let them grow like this until the first bulb has formed on the new growth and a second growth has started. 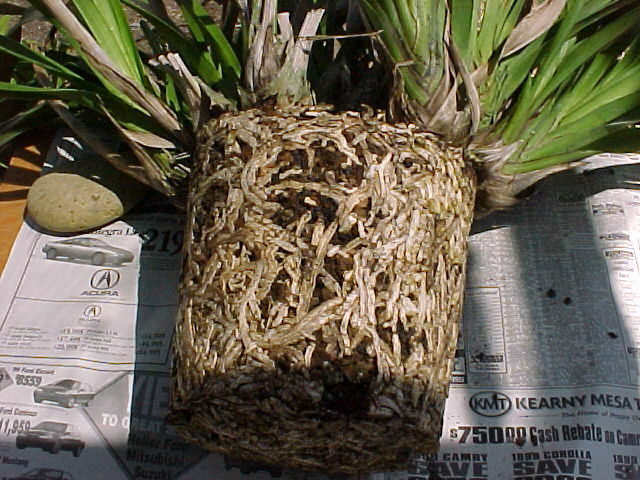 At that time, the backbulb division may be potted up in a larger pot. 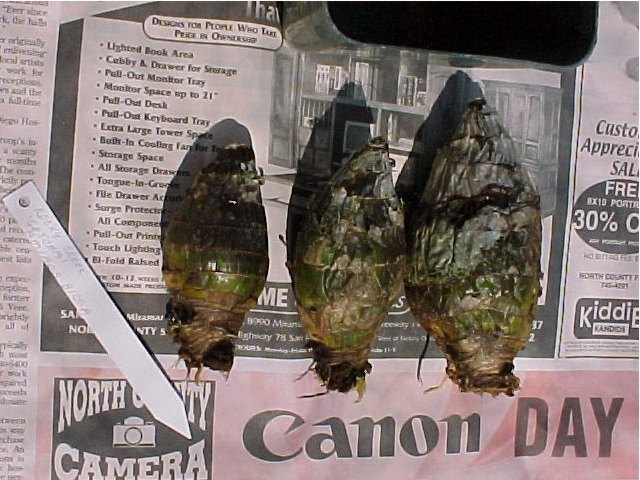 Backbulb divisions usually take 2 to 3 years to reach flowering size.